For a long time, Valentine’s Day was my least favorite holidays. It’s kind of funny – I love holidays. I love having excuses to shower people with gifts and show my friends my love and appreciation for them, and it’s why I like to go all out for Christmas. But Valentine’s Day? Valentine’s Day was a day where corporations took advantage of people’s consumerism, a day where couples were gross and loving, a day where single people would get left out and were forced to feel poorly about themselves for their singleness. As someone who was perpetually single for a really long time, I hated Valentine’s Day. Over the past few years in college, my best friend, Caitlin, has taught me to look at the holiday differently. She’s written me a card every year for those four years reaffirming her love for me and teaching me slowly that Valentine’s Day isn’t really about buying and receiving chocolates (although that’s definitely a plus because chocolate is great) or spending it with a significant other, but that it is just like any other holiday – a day where you are supposed to show your love and your appreciation for others. Last year was the first time I started to change my ways around this holiday. Since Valentine’s Day fell on President’s Day weekend, I visited New York and spent the day with Alyssa, one of my loveliest and oldest friends. We watched Deadpool, ate good food, and had a good time. This year, I wanted to make Valentine’s Day cards for a bunch of people that I love and wanted to show my appreciation for. 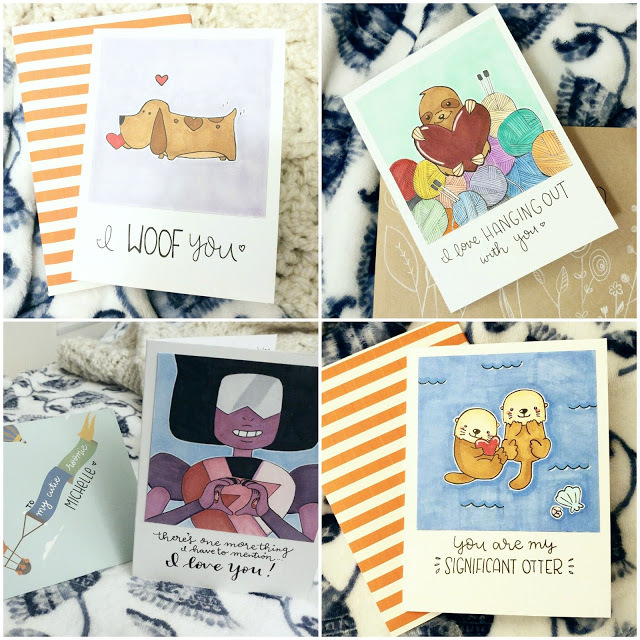 A sampling of the Valentine’s cards I made for my loved ones! I will be spending the actual day with Alyssa again. We’re planning on watching the Lego Batman movie. I can’t imagine a better way to spend the day of love with one of the women that I love to bits and has been there for me through a rather large portion (read: 8 or so years) of my life. I think Valentine’s Day is also a really good opportunity to reflect and think a bit about self-love as well. Loving myself has been a really long journey for me – it is definitely still a work in progress. I’ve always been a little bit too hard on myself, and it’s a hard habit to break. Art, unsurprisingly, has become a rather good outlet and exercise for working on my self-acceptance. I’ve been drawing and painting since I can remember, and when I draw, the entire world melts away. Drawing helps me focus. When I’m not feeling well and I don’t feel ready to talk about it, I’ll sketch something or do some coloring, and it never fails to calm me and take my mind off of my troubles. A few days ago, I wasn’t feeling my best about my self-worth and my self-love, and I wrote a poem.I’ve never written a poem before. Poetry was kind of this foreign, tangled thing that I didn’t understand and was too afraid to tackle. But I was feeling so badly about myself and so upset and so worthless that words just came out and turned into this sticky, complicated poem. I haven’t titled it, but here it is. A boy told me he loved me once. I thought I was broken once. I share my love with those who get close to me. I share it so it does not consume me. I hurt easily because I give my flames too freely. I told a boy I loved him once. He never said it back. This is not what happens in the movies. I give my flames too freely. I didn’t know -When you give out all your flames -Fierce, unwavering, consuming, burning -There is nothing left for me. One of my friends once told me that love was my biggest weakness. She said that my capacity to love made it really easy for people to hurt me, whether purposefully or accidentally. I once knew a girl in high school who I thought was my best friend, but when she graduated, she disappeared out of my life with no warning. That may have been the catalyst for one of my greatest insecurities. I’m constantly a little bit worried that the friends I have and love do not have the same feelings for me, that my presence is just convenient for them but that they will discard me when it suits them. My truest and most trusted friends, I think, are the ones where that insecurity has diminished.The insecurity is still there. Every time I make a new friend, or I reconnect with an old one, or I get closer to someone I was not as close to before, those feelings get drudged up. It’s a horrible thing to be constantly distracted by while forming new relationships, and it’s something I have been working on. I have yet to find a proper outlet to help me deal with them. What I can say, however, is that I think I have grown since Valentine’s Day of last year. I can say pretty confidently that I am more secure in my relationships and that I love myself a little bit more than I did before, and I think that is all I can ask for. In the meantime, thank you to all of the people in my life who love me when I cannot. I love you all, and happy Valentine’s Day!